The weekend was busy and I'm tired coming out of it but it was somewhat productive. I got to catch up on several tasks that I'd been meaning to do for weeks (some months!) One of these was that I actually finished knitting three birds for Cooper's Flock. They flew to New York to join the other birdies in the flock. Cooper's flock is made up of knit or sewn birds that will be given to pediatric cardiac patients and their families. The birds are in memory of Cooper, an infant born with a heart defect and whose little heart gave out a few weeks after he was born. His parents called him "birdie" because he made little cooing noises. Lucinda, the baby's mother wants to give these birds to the patient's families to let them know there's someone thinking of them who's been in their shoes. She's asking they be knit with Blue Sky Alpacas organic cotton because it's safe and less likely to produce allergic reactions for the babies. You can also sew a bird if you don't knit. More information over at Lucinda's Blog. i came to visit you and ended up at lucinda's blog. thank you for the link and the information. i am looking forward to contributing to this healing project. 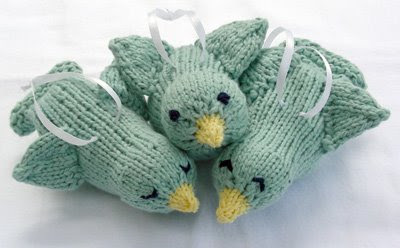 i don't yet know how to knit but can sew and will have to make a few birds myself to send.